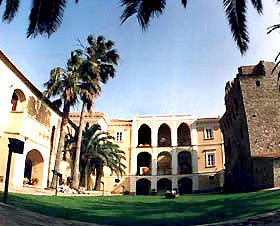 Built in various phases, from the XI to the XVIII century, Palazzo del Capo, once the sumptuous coastal residence of the Dukes of De Aloe, was declared edifice of "noteworthy artistic and historic interest" in 1986. After extensive and accurate restoration work, the building opened as unique 5 star hotel, complete with superb function rooms, restaurant, and luxurious guest accommodation. The rooms and suites of Hotel Palazzo del Capo offer the utmost in comfort; all beautifully appointed with carefully selected items of period furniture and exquisite, hand embroidered bed and bathroom linen. Guest rooms open out on to spacious balconies from where to enjoy views of the sea and the meticulously kept gardens surrounding the Palazzo. Guests dining at Hotel Palazzo del Capo's restaurant are presented with menus featuring a superlative selection of both traditional Calabrian dishes and innovative contemporary Mediterranean and International cuisine. 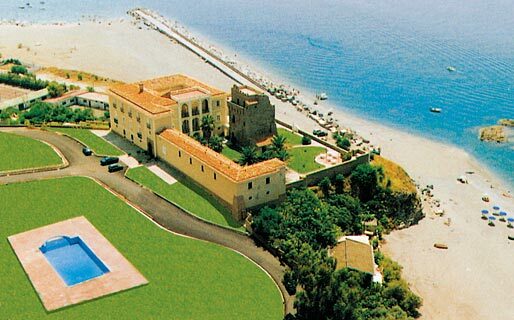 Palazzo del Capo, right on the sea's edge on a coastline afforded shelter by the nearby mountains, offers visitors to this part of Calabria the opportunity to experience a vacation immersed in the culture, the art and the hospitality of bygone times in an atmosphere of rare splendor. By car: A3 motorway Salerno-Reggio Calabria, Lagonegro exit: Km 80; Reggio Calabria-Salerno, Falerna exit : Km 65. By plane: International Airport S. Eufemia Lamezia: Km 85; Minniti - Reggio Calabria Airport : Km 150. By train: Paola train station: Km 30. From Hotel Palazzo del Capo the towns of Paola, San Marco and the Terme Luigiane are all within easy reach, as are the popular tourist destinations of Maratea, Diamante, Isola di Dino, Costa dei cedri, Sibari, Isola Capo Rizzuto, and the Sila and Pollino Nature Reserves.